How to get first N Fibonacci terms in Java? 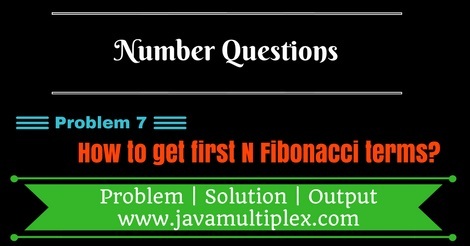 Home Basic Number Questions How to get first N Fibonacci terms in Java? Write a program in java that prints first N Fibonacci terms. In Fibonacci sequence every number after the first two terms is the sum of the two preceding terms and it is defined by following recurrence relation. For example - First 10 Fibonacci terms are 1,1,2,3,5,8,13,21,34,55. * @problem How to get first n fibonacci numbers? Output - How to generate first n Fibonacci terms in Java? Tags : Fibonacci terms in Java, Solution in Java, Dynamic programming, for loop, if else statement. How to change Time Zone in Java? How to convert Calendar to Date in Java? How to convert given Date to Calendar in Java? How to get month name of given date in Java? How to convert Date to LocalDate in Java? How to convert LocalDate to Date in Java? How to convert Date to LocalDateTime in Java? How to convert LocalDateTime to Date in Java?